Golden Eagle Casino is open 24 hours with over 45,000 square feet of gaming excitement! Play the newest slot machines plus all of your favorite table games – blackjack, craps and more! 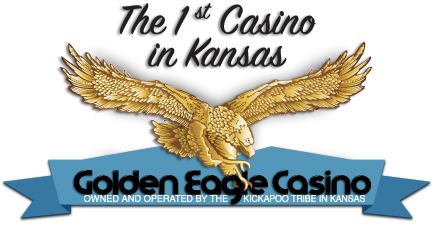 Golden Eagle Casino is located on the Kickapoo Nation Reservation, just 6 miles west of Horton, Kansas. Love blackjack, craps and video poker games? So do they. From penny to high limit action, at Golden Eagle Casino, they know that looser slot machines mean longer play and more jackpots. That’s why they have a wide selection of slot machines that are looser than most, offering improved odds every time you play. Just look for the A Better Chance to Win signs located throughout the casino floor. Playing slots are even more fun when you win. They’re all about value and fun! Looking for dinner and casino action, all in one place? No matter what you’re in the mood for, Golden Eagle Buffet offers a variety of breakfast, lunch and dinner options to keep you satisfied while you play. From contemporary gourmet to classic comfort fare, our casino dining will serve every taste you’re craving for.